Orchids are extremely diverse not only in color, size, and bloom shapes, but also in the way they smell. Common orchids sold in grocery stores, home improvement stores, and florists are usually not fragrant so if you’re interested in finding a fragrant species or hybrid, you’ll need to seek it out at an orchid farm, nursery, or online seller. Sometimes an orchid’s fragrance is sweet and pleasant—but some can even be revolting and smell of rotting meat! In this article we’ll talk about 11 orchid varieties that are best known for their pleasant smelling fragrance and that we recommend you to try out. These are only a very small handful of wonderful-smelling orchids, and is by no means a comprehensive list. Aeranthes grandalena: These flowers are said to have a sweet jasmine scent. Brassavola nodosa: Commonly known as “Lady-of-the-Night,” orchid. This orchid has beautiful white flowers that are said to smell of a strong freesia or lily-of-the-valley scent. 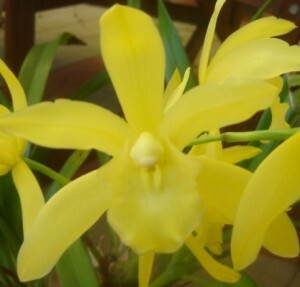 Cymbidium Golden Elf: This is a Cymbidium hybrid that produces beautiful yellow flowers and give off a lemony scent. Maxillaria tenuifolia: Commonly known as “Coconut Pie Orchid” and its tiny blooms smell deliciously like coconut. Miltoniopsis santanaei: This small orchid has beautiful white flowers that emit a wonderful rose smell. Oncidium Sharry Baby: This popular Oncidium hybrid smells like chocolate, however, some liken it to more of a vanilla scent than chocolate. Oncidium Twinkle Fragrance Fantasy: Another Oncidium hybrid. This one produces a strong and spicy vanilla scent. Phalaenopsis violacea: This small beautiful orchid is said to emit a spicy cinnamon smell. Rhynchostylis gigantea: An orchid has large flowers that give off a very powerful citrus smell. Vanilla planifolia: These blooms only open up for one day or less, but during that time, they put out a lovely sweet smell of Vanilla. 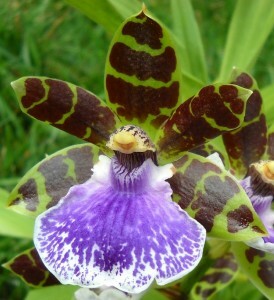 Zygopetalum: There are many fragrant Zygopetalum hybrids. There is debate on what the scent smells like and has been described as smelling of hyacinths, freesias, and even baby powder. The next time you are looking for a new addition for your orchid collection, you may want to go with something that puts off an enticing scent!